At independence in 1975, Mozambique was one of the world's poorest countries. Socialist mismanagement and a brutal civil war from 1977-92 exacerbated the situation. In 1987, the government embarked on a series of macroeconomic reforms designed to stabilize the economy. These steps, combined with donor assistance and with political stability since the multi-party elections in 1994, have led to dramatic improvements in the country's growth rate. Fiscal reforms, including the introduction of a value-added tax and reform of the customs service, have improved the government's revenue collection abilities. In spite of these gains, Mozambique remains dependent upon foreign assistance for more than half of its annual budget, and the majority of the population remains below the poverty line. Subsistence agriculture continues to employ the vast majority of the country's work force and smallholder agricultural productivity and productivity growth is weak. A substantial trade imbalance persists although the opening of the Mozal aluminum smelter, the country's largest foreign investment project to date, has increased export earnings. At the end of 2007, and after years of negotiations, the government took over Portugal's majority share of the Cahora Bassa Hydroelectricity (HCB) company, a dam that was not transferred to Mozambique at independence because of the ensuing civil war and unpaid debts. More power is needed for additional investment projects in titanium extraction and processing and garment manufacturing that could further close the import/export gap. Mozambique's once substantial foreign debt has been reduced through forgiveness and rescheduling under the IMF's Heavily Indebted Poor Countries (HIPC) and Enhanced HIPC initiatives, and is now at a manageable level. 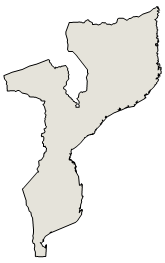 In July 2007 the Millennium Challenge Corporation (MCC) signed a Compact with Mozambique; the Compact entered into force in September 2008 and will continue for five years. Compact projects will focus on improving sanitation, roads, agriculture, and the business regulation environment in an effort to spur economic growth in the four northern provinces of the country. Mozambique grew at an average annual rate of 9% in the decade up to 2007, one of Africa's strongest performances. However, heavy reliance on aluminum, which accounts for about one-third of exports, subjects the economy to volatile international prices. The sharp decline in aluminum prices during the global economic crisis lowered GDP growth by several percentage points. Despite 8.3% GDP growth in 2010, the increasing cost of living prompted citizens to riot in September 2010, after bread price increases were announced. In an attempt to contain the cost of living, the government implemented subsidies, decreased taxes and tariffs, and instituted other fiscal measures.